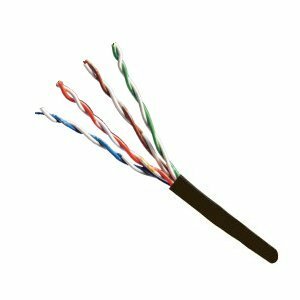 Cat5e cable is used with offices and homes to link your PCs, laptops and other devices together onto a network. Often there is a need to run cat5e cable external. It is often cleaner and easier for your house. Laying a cable around the outside, or following a drainpipe or natural line of your house to connect different rooms and floors can be achieved. If you laid normed cat5e cable, the sheath or cable covering would be exposed to elements and variable temperatures. Indeed sunlight alone will cause the sheath to be damaged over time. External cat5e is made by sheathing the twisted pairs within a layer of Polyethylene. This is normally black and resistant to the elements. Typical prices for external cat5e is around £100 or so depending on where you get it. The external cable is typically sold in 305 or 500 meter reels. Using Cat5e external cable does present some issues if you try to link separate buildings together. Potential differences can build up between the buildings and electrical energy can transfer, blowing ports or kit. Within the same building, it should not present too many issues, unless you get hit by lightning!